According to the American Optometry Organization, it has been estimated that as much as 80% of the learning a child does occurs through his or her eyes. That is why Dr. Peña and Dr. Anderegg feel so strongly about eye exams for children. Each year TSO Kerrville staff participates in several school vision screenings throughout Kerrville and the surrounding areas. Dr. Peña has also developed a program called Vision to Learn. Vision to Learn is a program that provides vouchers for eye exams and glasses at no charge to students that school nurses have identified as needing assistance. The vouchers are designed to be used for students that typically “fall through the cracks” not having insurance or qualifying for government assistance. Dr. Peña and Dr. Anderegg also participate in voucher programs through the Lion’s Club and Vision Service Plan to provide discounted exams and eyeglasses to those in need. Our TSO team has volunteered their hearts and handiwork with Habitat for Humanity and collected toys at the holiday donation drop off for Toys for Tots. As 2014 and 2015 Participants and Bronze Sponsors for Relay for Life, our team The TSO Cancer Crushers raised awareness and funds in support of the American Cancer Society. 2015 Hill Country Charity Ball Association Underwriter. This year’s event is raising much needed funds for our local American Youth Soccer Association (AYSO) which is a child-first and child focused organization. They make happy, healthy children a priority. We also participate in the Hope Ministry through The Society of St. Vincent de Paul. This provides for individuals in need, by assisting with vouchers for eye exams and glasses if necessary. The Society of St. Vincent de Paul helps people of all faiths acting in a compassionate and loving manner. Dr. Peña and Dr. Anderegg are frequent supporters of Notre Dame School, St. Mary’s School, ACTS ministries, local area volunteer fire departments, and various other organizations that impact our community. Each year we have an awareness campaign for breast cancer. In 2014 our offices held a Facebook competition to generate awareness and awarded a prize of the Oakley Breast Cancer sunglasses! In 2014, our Emporium booth at the Executive Women’s Club 13th Annual “Making Cancer Disappear” Baubles & Beads Style Show and Luncheon was manned by our own cancer survivor Donna. Donna and Melissa showed off our latest pink eyewear styles and signed attendees up to win a pair of BCBG sunglasses. Proceeds benefitting the EWC Scholarship Fund and the purchase of new PET Scan imaging equipment and software to help local cancer specialists and radiologists monitor treatment effectiveness. Annual attendance at the Schreiner University Health and Wellness Fair and the Bandera ISD Employee Benefit and Wellness Fair to offer vision screenings, discuss eye disease and answer questions about benefits. Dr. Peña and Dr. Anderegg have supported the YMCA children’s football, Newspapers in Education and other local sports teams. To kick off the holiday season we enjoy the Holiday Lighted Parade in Kerrville and Light the Night Parade in Fredericksburg. Employees and their families donate their time and talents in building and decorating our giant size, illuminated sleigh. Our talented elves hit the parade route to spread holiday cheer!! Each year we brave the August heat with our float in The Gillespie County Fair Parade in Fredericksburg. The Gillespie County Fair is the oldest running fair in Texas! Last year as a 2014 Sock Hop contributor we donned our bobby socks and poodle skirts to participate in this family friendly fundraising event for the Kerrville Historic Downtown Business Alliance. 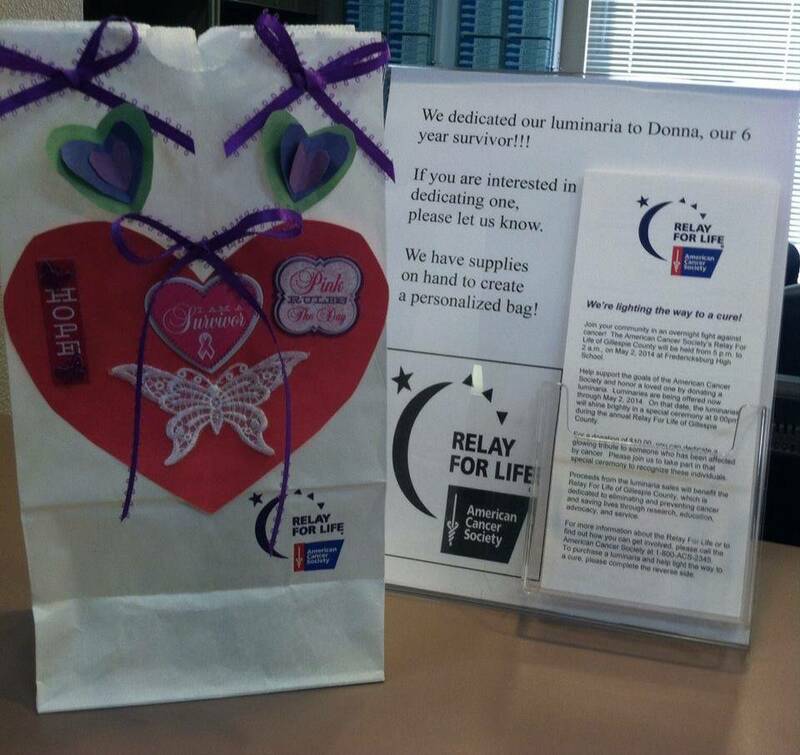 Our Kerrville and Fredericksburg offices have joined Relay for Life Kerr County to help fight the battle against cancer. Our team the TSO Cancer Crushers raised over $1000 last year for Relay for Life, and we’ve raised the goal to $1200 this year. 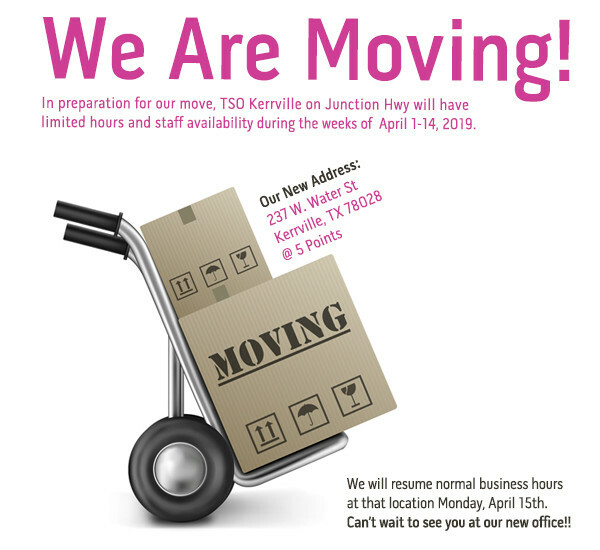 Consisting of the entire staff from our TSO Kerrville and Fredericksburg offices, we have a lot of motivation, because most of us have had cancer touch the lives of loved ones or friends. We even have a survivor of 7 years on our team! We celebrate Donna each year as we relay and honor and remember those others we know that have battled cancer. We will be selling Luminaries at our office and also, at both our garage and bake sales coming up. The Luminaries are a great way to honor someone that has battled cancer. We will provide the dedication forms, luminaries and supplies to decorate them as well. Our goal is to raise $1200 with fundraisers and events leading up to our main event on April 24th 2015-RELAY FOR LIFE! 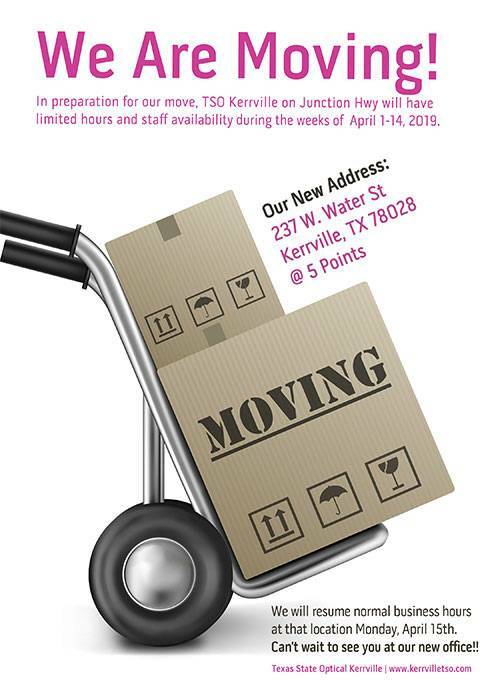 If you have any items you would like to donate, please contact Jamie @ 361-296-5242 for pick up or items can be dropped off at either office location. All proceeds will go towards our goal! 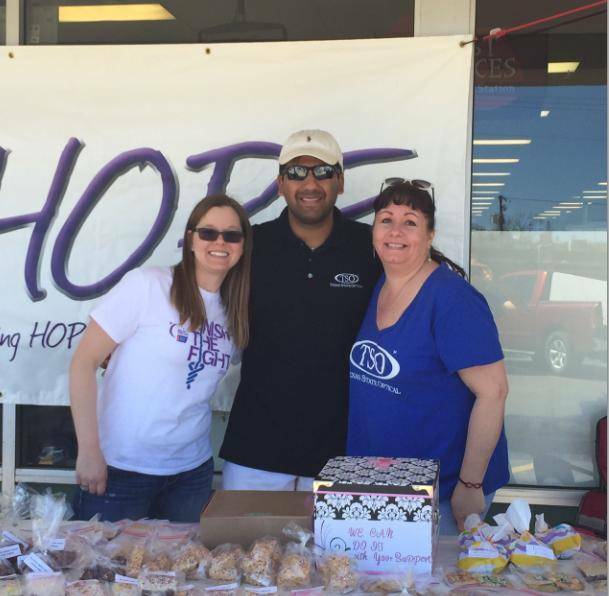 Saturday, March 28th from 9am-2pm Bake Sale- at Hastings in Kerrville-Please come by and purchase all of your favorite baked goodies outside of Hastings Bookstore at 501 Main St, Kerrville. All proceeds will go towards our goal. We invite you to join us in the fight against cancer in our community! 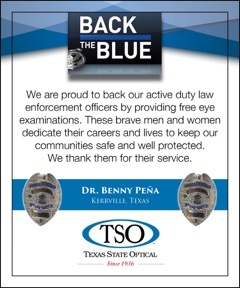 At Kerrville TSO, we believe strongly in giving back to the community and caring for the eyes of all those in need. Outreach programs represent an opportunity to show the community the level of commitment our optometrists have to their community. The staff also plays an important role in community outreach. All of our offices participate in the Luxottica Vision’s One Sight as well as other charitable services.